Are you ready to turn your front yard into a haunted autumnal trick-or-treat lair? No? Well, you better get started! We, of course, fully encourage you to go all out in your decorating. Because we take Halloween very seriously! First and foremost, we're about costumes, obviously. Costumes are a ton of fun, but decor and decorating scenes can make Halloween awesome and memorable, too. Which is why we have a full selection of Halloween decorations, from inflatables to animatronics to simple LED light sets like this one! These Purple Frost LED 50 Indoor/Outdoor String Light Set features 50 purple wide angle LED bulbs. They're wired together on a 25 and a half foot long wire, with a 4" lead, 6" of spacing between lights, and a 4" tail. 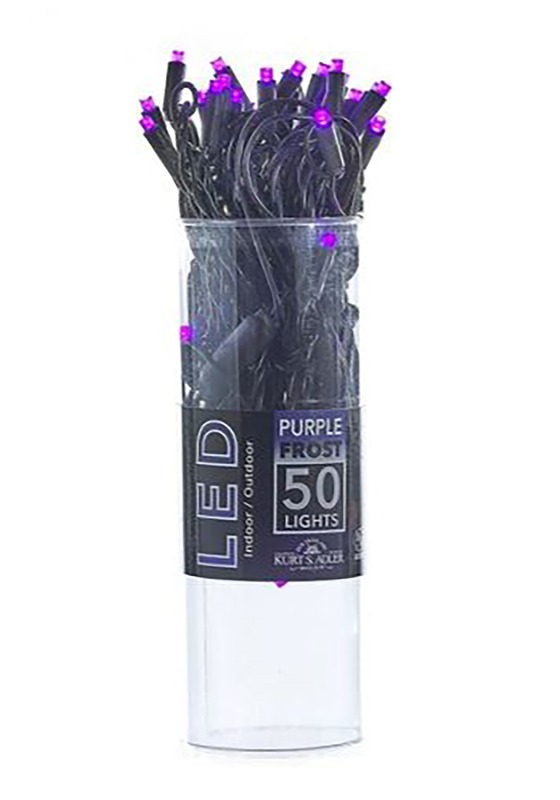 With an end connection, you can connect up to 16 light sets together, and we've got them available in a variety of colors, too, so you can mix and match or pick up a few Purple Frost sets to create a spooky and haunted effect! Lights might set the mood, but some creatures are sure to add the fright. Be sure to shop our selection of props and animatronics to complete the scene. With a few well thought out spooky selections, we're sure your yard will be the top trick-or-treat spot!